Anyone knows what happened with the typical vocals of Tomas Liljedahl, bassist and guitar player of Breach? Well they are back in The Old Wind and I am glad they have a new band because the dragging sick vocals were missed together with the sinister Breach vibe. All the members have created six slow and powerful songs that drag you down in the deepest forests of Sweden. Robin Stapps from Pelagic Records/The Ocean signed the band but also joined them on guitar to create an extra thick guitar sound. After a creepy intro of a child talking some words the raw and cold ride of The Old Wind starts. The sound is still cloaked in mystery and you have to imagine it’s combined with Cult of Luna around the first album with some slower Knut stuff involved. The organic mix (the real sounding drums especially! ), the voice (check the grim-faced scream in ‘I’m Dead’) and the great melodies making this record is stuck in your head immediately. If you talk about ‘I’m Dead’, ‘Raveneye’, ‘The Old Wind’ or ‘Speaks of a Thousands´ they all have that perfect melody and melancholic atmosphere their old band was a master in. The noisy production gives the music an extra bite and it feels the screams are recorded deeply in red. The six songs are grabbing you by the throat and never will let you go in the 35 minutes. 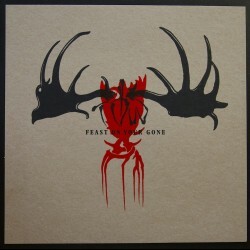 Feast on your Gone is a cold album; aggressive and miserable at the same time. Beautiful miserable! When the end riff is started in ‘Reign’ together with the deformed vocals and then when the final icy screams kicks in you really feel the total collapse. During the writing of this review I first read of the explosions at the finish of the Boston marathon. I couldn’t have a better soundtrack by reading this awful news. The band never played live, rehearsal are scheduled in May so better come up with a tour. Let’s see what happens when the songs are played live. For now there is a digipack and a vinyl version on clear with hand silk-screened cover art. If you want to pick up something from a special band in the heavy sector this is your best shot of 2013.